When it comes to snowmobiling in the Great State of Wisconsin, you need to ask yourself whether you want to hit the groomed trails or ungroomed forest roads. Northern Wisconsin is one of the best places in the country to go snowmobiling. There are over six hundred miles of groomed trails and over one thousand miles of ungroomed forest roads just waiting for you to explore. From simple trails to complex roads for the more seasoned snowmobile rider, there’s a little something for everyone to see and do. Winter recreation rentals make it easy to get to all of the most unforgettable scenic spots in the Bayfield area. Riders that are new to the North Wisconsin snowmobile trails or new to snowmobiling in general, should stick to the groomed trails. These are great for new, inexperienced, young and older riders who want all of the excitement without the off-the-beaten-path risk. These marked trails will help you become familiar with how the machine works when you rent snowmobiles in Wisconsin for the first time. Winter recreation rentals can be a lot of fun, but it is important to follow the guidelines for safety so you can have an enjoyable experience. There are over 600 miles of groomed trails throughout the immediate area, so there’s no reason why you can’t take your Bayfield snowmobile rentals out on a marked route while you gain your confidence and increase your skill level. Just because these particular trails are groomed does not mean that they won’t be challenging for even intermediate and advanced users. With all of the hills, valleys, wooded areas and shorelines in the North Wisconsin area, there is much to see and explore. Groomed trails are also designed to lead you from one fun destination or activity to another. Check the trail maps and plan out your trip to visit some of the area’s best restaurants, shops, pubs and hot spots. Don’t forget to make plans to gas up your winter recreation rentals while you are out exploring the North Wisconsin snowmobile trails. Make sure to go over the proper methods for adding fuel and oil to your rented snowmobile as it is needed with the folks at Adventure North Rentals to make sure you understand how it all works. Experienced riders who rent snowmobiles in Wisconsin will often go off the marked path to add a little adventure to their ride. Once you get the hang of the machine and explore some of the groomed North Wisconsin snowmobile trails, it’s time to go for a little challenge. It is important to understand that the ungroomed forest roads will have a higher level of difficulty, which is why they are sought out by more experienced riders. If you decide to take the plunge, do so at your own risk. Go slowly to make sure you avoid any obstacles that might be in the way. Unlike groomed trails that are checked and cleared throughout the season, fallen trees and other objects might be on the roads. It is always better to be safe than sorry. There will also be more rough spots, sharper turns and other things that you will need to navigate around quickly, so taking it slowly can help you stay safe while building your snowmobiling skills. If you are looking for some extra adventure, speak with one of the staff members when you pick up your Bayfield snowmobile rentals at Adventure North Rentals. Most of these ungroomed forest roads are actually listed on the trail maps that are available for visitors and we can help you find your way to a very memorable experience. 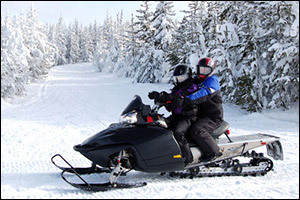 Be careful to stay on public lands or areas that are designated for snowmobiling – groomed or not. You do not want to end up on private property or protected lands. That could carry some pretty big consequences. When in doubt, ask. Groomed or Ungroomed – Just Have Fun! Whatever type of North Wisconsin snowmobile trails you decide to explore with your Bayfield snowmobile rentals, just make sure you have fun. Always adhere to the safety guidelines, wear your protective helmet, gloves and proper clothing while you create your own winter wonderland adventure. 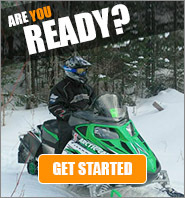 If you are looking to rent snowmobiles in Wisconsin or are interested in other types of winter recreation rentals, contact Adventure North Rentals in Bayfield, Wisconsin. Our staff is here to help you get the equipment you need to make the most out of your visit. Make your reservations by calling us at 715-779-3150 or contact us to ask questions about any of our snowmobile and ATV rentals.